Sonya Min loves telling stories by combining copy and graphics. She fights for white space and is most proud when she can bring a touch of humor to concepts and design. With wide-ranging experience in everything from textile design, broadcast media to luxury campaigns, she is excited to be helping NTEN tell its story visually! She received her BFA at the Art Center College of Design in Pasadena, CA, a long long time ago in Packaging, Graphic Design. 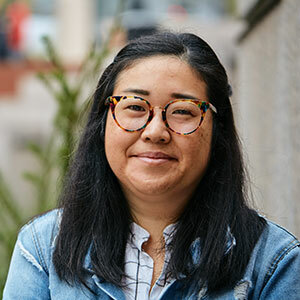 When not at NTEN's Portland headquarters, Sonya loves to explore the city, travels every chance she gets and says: "I don't believe in staycations." She has a Jindo pup who will always be 6 years old to her, no matter how old he really is.